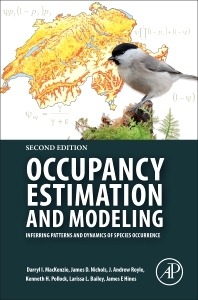 Occupancy Estimation and Modeling: Inferring Patterns and Dynamics of Species Occurrence, Second Edition, provides a synthesis of model-based approaches for analyzing presence-absence data, allowing for imperfect detection. Beginning from the relatively simple case of estimating the proportion of area or sampling units occupied at the time of surveying, the authors describe a wide variety of extensions that have been developed since the early 2000s. This provides an improved insight about species and community ecology, including, detection heterogeneity; correlated detections; spatial autocorrelation; multiple states or classes of occupancy; changes in occupancy over time; species co-occurrence; community-level modeling, and more. Occupancy Estimation and Modeling: Inferring Patterns and Dynamics of Species Occurrence, Second Edition has been greatly expanded and detail is provided regarding the estimation methods and examples of their application are given. Important study design recommendations are also covered to give a well rounded view of modeling. Dr. MacKenzie is biometrician for Proteus Wildlife Research Consultants in New Zealand. His main area of expertise is in using occupancy models for monitoring and research. He started working in this area while on a year long stint at Patuxent Wildlife Research Center with Drs William L. Kendall and James D. Nichols during 2000/01. He has acted as a statistical consultant to the Department of Conservation, Ministry of Fisheries and the U.S. Geological Survey. 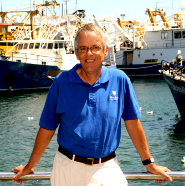 In 2002 Darryl was awarded a prestigious Fast-Start Marsden Grant from the Royal Society of New Zealand for research into optimal study designs for estimating the proportion of area occupied by a target species. James Nichols received a B.S. in Biology from Wake Forest Univ., M.S. in Wildlife Management from Louisiana State Univ., and Ph.D. in Wildlife Ecology from Michigan State Univ. He has spent his entire research career at Patuxent Wildlife Research Center working for the U.S. Fish and Wildlife Service, the National Biological Service, and now the U.S. Geological Survey. He is currently a Senior Scientist at Patuxent. His research interests focus on the dynamics and management of animal populations and on methods for estimating population parameters. Dr Royle is currently a Research Statistician at the U.S. Geological Survey's Patuxent Wildlife Research Center. His research is focused on the application of probability and statistics to ecological problems, especially those related to animal sampling and demographic modeling. Much of his research over the last 10 years has been devoted to the development of methods illustrated in our new book. He has authored or coauthored more than 100 journal articles, and co-authored the books Spatial Capture Recapture, Hierarchical Modeling and Inference in Ecology and Occupancy Estimation and Modeling: Inferring Patterns and Dynamics of Species Occurrence, all published by Academic Press. This is the most recent edition of a classic that set the standard for occupancy modeling research. This is updated, clearly laid out, easy to understand, and authoritative. An outstanding resource. I think this is a fundamental book for people who interested in studying spatial ecology of wildlife and plant (dermatology filed also), especially for students. The book include all vital information, evolution of the the concepts plus examples. There many recent researches included in this new edition, update from the first one in 2002 as due to it popularity increasing over time since the first one released. I appreciate that I can own one, that will be one of my good reference that will definitely used when I write and analyze data for my thesis in next couple years. I bought this book before starting an occupancy modeling study on bats in order to help determine best practices. It has served this purpose well, and I could read up on the topics I needed without being put to sleep. I particularly enjoyed the study case concerning trolls in Middle Earth.